The name of the church may also refer to the adjacent Naples music conservatory, which occupies the premises of the monastery that used to form a single complex with the church. 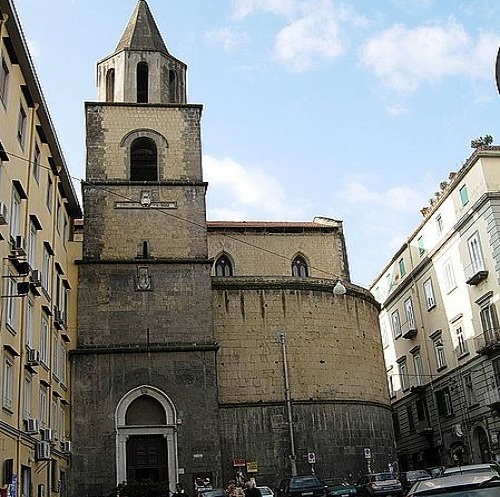 The church is located on the anonymous street and is considered one of the most significant examples of Angevin architecture in Naples, built at the wishes of Giovanni Pippino da Barletta, one of the knights of Charles II of Anjou and the one responsible for destroying the last Saracen colony on the southern peninsula, in Lucera. The church was dedicated to Peter of Morrone, a hermit monk from Maiella (near Sulmona - Abruzzo) who became Pope Celestine V in 1294. He was the founder of the Celestine monastic order, which occupied the church until 1799, when monasteries were suppressed by the Neapolitan Republic. As was the case with much Angevin architecture in Naples, San Pietro a Majella underwent a Baroque make-over by the Spanish in the 17th century, but 20th-century restoration attempted to "undo" that and to restore the building to its original Gothic appearance. The first remodeling of the church took place in the late fifteenth century by the king Robert of Anjou and later, in 1508, by Alfonso I Aragon which radically changed the structure. The purity of the interior is the result of renovations that between 1888 and 1927 returned the church the original Gothic appearance. 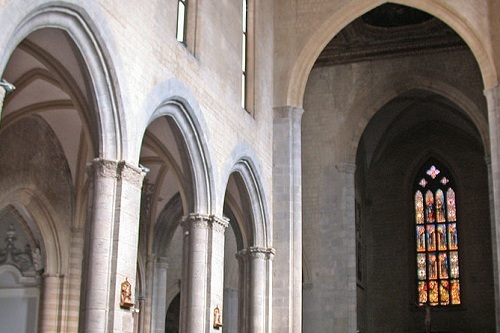 The interior, in Gothic style, has a Latin cross plan with three naves. From the side aisles leads to the chapels, where you can admire the works of Francesco De Mura, Giacomo del Po, Giuseppe Troccola, all representatives of the painting of the eighteenth century. Alongside of the apse are two chapels on each side. 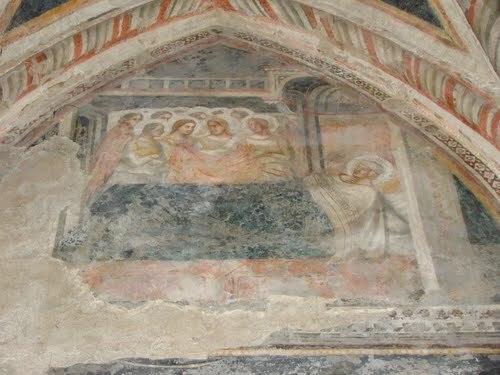 In the second chapel on the right you can admire the frescoes of Stories of San Martino di Tours by the Master of the Cappella della Leonessa. In the first chapel on the right is the statue of Saint Sebastian by Giovanni da Nola Merliano, the greatest exponent of Renaissance sculpture in Naples. 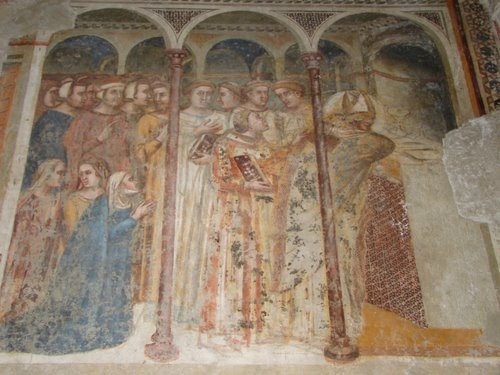 Much of the art work within the church is dedicated to various phases in the life of the monk Pietro and then Pope Celestine V.
Preserved in the church are works by Massimo Stanzione, Paolo De Matteis, Francesco De Mura and sculptures by Giovanni da Nola, Lorenzo Vaccaro and an altar by Cosimo Fanzago.